In September 2010 The New Psychology of Leadership was launched at the British Science Festival in Birmingham. 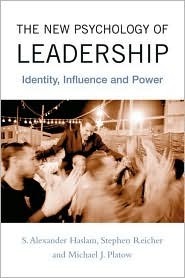 Co-authored by Alex Haslam, Steve Reicher and Michael Platow, the book presents a new analysis of leadership that is informed by social identity theorizing as well as a wealth of empirical data from experimental, historical and field settings — including the BBC Prison Study. Published by Psychology Press, it is available in paperback for around $25 or £15. In his foreword to the book, the Nobel Laureate George Akerlof comments "This captures the true structure of what leadership is all about. Accordingly, on almost every page of the text there is a new subtlety about what leadership means and about how it works. It takes a subject older than Plato and as current as Barack Obama in a new and correct way." You can look inside the book here. In September 2010, CBC broadcast a lecture by Alex Haslam that discusses the book's main arguments. This was presented on Paul Kennedy's Ideas program and organized by the Canadian Institute for Advanced Research as part of its "Next Big Question" public lecture series. The lecture can be listened to at the CBC site.